The problem with most jazz treatments of Bach is that creatively they are somewhere on the moderate side of Yo-Yo Ma. But not so a radical new CD which uses improvisation to bring together the music of Johann Sebastian Bach and John Coltrane. Jazz saxophonist Raphaël Imbert has made an academic study of the spiritual elements of jazz and reveres John Coltrane, who said "my goal is to live a truly religous life and express it in my music", as the only true mystic in the history of jazz. 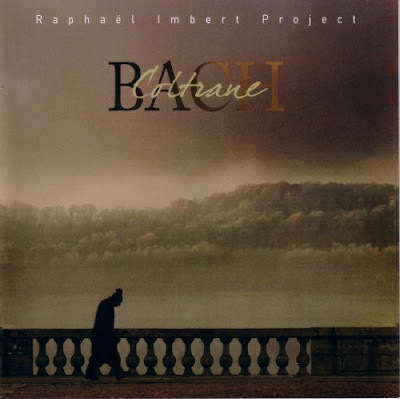 For the CD Bach-Coltrane Imbert teams up with jazzers Jean-Luc Di Fraya (percussion) and Michel Péres (bass) for the Coltrane, the Manfred string quartet for the Bach, while classical organist André Rossi, counter tenor Gérard Lesne and Imbert spread themselves across a CD which is based on the saxophonist's credo of "wherever we come from, we are all musicians". Bach-Coltrane departs from the world of Jacques Loussier and the Modern Jazz Quartet by its willingness to ignore comfort zones as well as stylistic boundaries. Just one example is Gérard Lesne who ranges from the first air from Bach's Cantata BWV 170 to an unforgetable rendering of Coltrane's 'He nevuh said a mumbalin word' which is the main highlight on a disc of many highlights . Time for the punch-line, and regular readers will know what I am going to say. Bach-Coltrane is yet another outstanding release from a small independent label - Paris based Zig-Zag Territoires. Can't the major labels put the same rocket-juice in their water? The packaging is beautiful and supplies both my graphics. 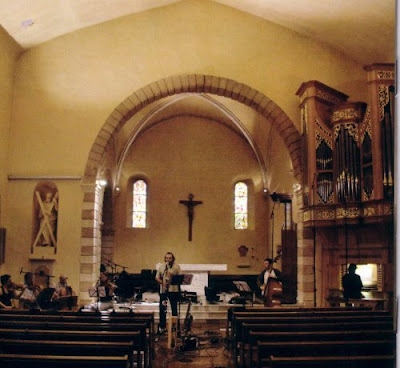 The header shows the session in the church of Saint André, Bouc Bel Air in France where the wonderful new 'Bach style' organ provided the canto fermo for the project. Zig-Zag's main man Franck Jaffrès delivers stunning sound, and a comprehensively documented CD includes excellent main notes from Raphaël Imbert and a full description of the organ of Saint André which is one of the real stars of the recording. I bought a bundle of CDs on my recent trip to France and I have several more discs to share with you. But Bach-Coltrane has been played more than any of the others since I found it in the Harmonia-Mundi Boutique in Nantes. There are moments on it which transcend any musical category, particularly André Rossi's Choral de Mi and the Manfred Quartets concluding "O Welt, ich muss dich lassen", BWV 45. Recommended not just for Coltrane loving Democrats, but for anyone who wants to explore beyond their comfort zone. Thanks for exposing this interesting music! Sounds really interesting! I'd list Albert Ayler, Pharoah Sanders and Sun Ra as mystics, too.